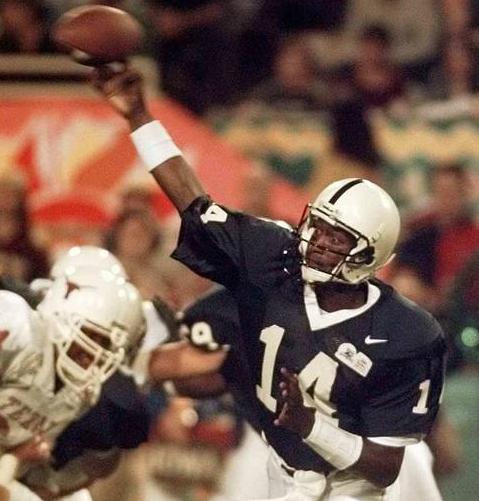 I think the most underrated QB in Penn State history was also the first [long-term] African-American starter they had at the position. 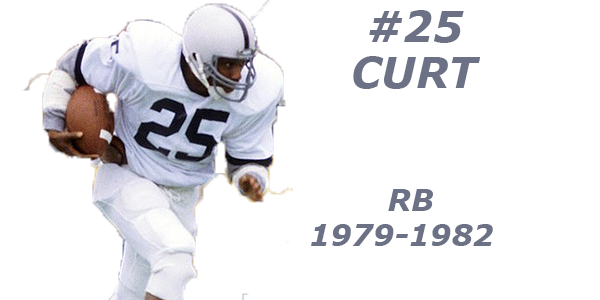 From the first game he played as a true freshman, Wally Richardson embodied the team player Joe Paterno insisted his players become. His career QB rating is 117.1, and he led Penn State to two bowl wins, a 43-14 Outback Bowl thrashing of Auburn and a 38-15 Fiesta Bowl drubbing of Ricky Williams and Texas, and a top-10 finish in 1996. Richardson was also the field general of the best drive the Lions ever orchestrated: a no-timeout nail-biter, ending in a TD pass to Bobby Engram in East Lansing to sink the Spartans. I mention Wally Richardson because he had the misfortune to ultimately be the primary backup to Kerry Collins, whom most Nittany Lions fans acknowledge as the best overall QB to play at Penn State. When following a legend, expectations are unreasonably high. The collection of offensive talent on the 1994 Penn State team is likely something we’ll never see again, save the possible exception of 2016. With the benefit of a couple years of history, the 2017 squad had every bit of the explosiveness of the 1994 team. An elite QB (Collins, Trace McSorley), a record-breaking slot receiver (Engram, DaeSean Hamilton), a big, pass-catching tight end (Kyle Brady/Mike Gesicki) and a deep threat (Freddie Scott/Juwan Johnson) in addition to two elite running backs in Ki-Jana Carter and Barkley. Enter Miles Sanders. Just as Richardson was given the reigns after Collins and Co., Sanders is being asked to replace an irreplaceable, once-in-a-generation player. Richardson had to look over his shoulder when his team invariable failed to replicate the 1994 team’s greatness; his backup Mike McQueary finished the 1996 Indiana game, for example. 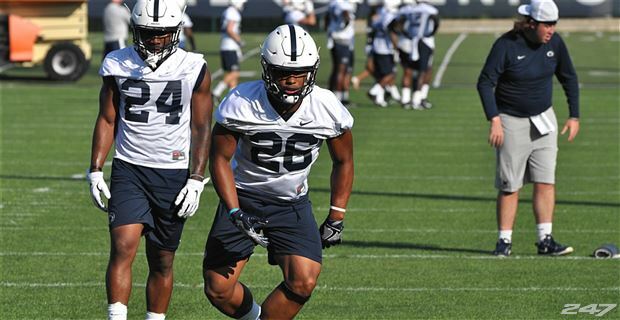 How should Miles Sanders approach this season? He has game-breaking speed and pass-catching ability in his own right. 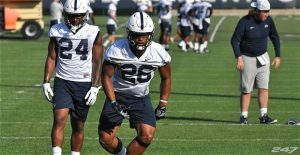 One of the detriments in Saquon Barkley’s style is the risk-reward nature of the way he runs. Lost in the explosive plays were the fairly common tackles for loss when he tried to make a big play out of nothing. To his credit, the reward typically far outweighed the risk. However, when injuries to the offensive line allowed the defense to run blitz, Barkley was basically nullified in relevant games the entire second half of the 2017 regular season. Barkley’s career yards per carry at Penn State was 5.7, despite a slew of long rungs and splash plays. Sanders, conversely, has a 6.7 career YPC, albeit a much smaller sample size largely against backups in mop-up duty. But Sanders too played with the Lions’ second team on the field, with an offensive line that has struggled with depth in recent years. It’s foolish for Sanders to try to emulate Barkley’s style. They are the same height, but Sanders is nearly 30 lbs lighter. For Sanders to be successful, he should do everything he can to help the offense maintain balance, taking some of the load off of Trace McSorley. He’ll have his chances, and hopefully with more yards early in a series of downs, a spectacular play won’t be needed to pick up first downs with a more traditional, disciplined style of running. All eyes will be on #24, as he steps into an unimaginable shadow. But Sanders is a great athlete and runner in his own right, coming out of Woodland Hills high as a 5-star burner with pure speed who can break a long run at any time. He knows the offense, the personnel, the blocking scheme, and the opposition. And while he has patiently waited his turn learning all that, Sanders has to make sure he plays his game to maximize his chance. Just like Wally did.